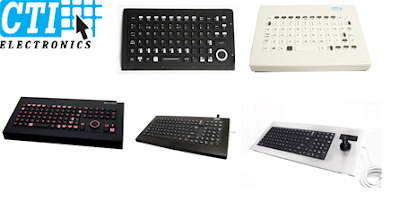 The CTI Electronics Corporation is one of the leading and preferred manufacturers of rugged and reliable industrial keyboards. These advanced and NEMA 4 (IP66) sealed keyboards have broad ranges of applications in processing, medical laboratories, machining factories, military, security, commercial fleet vehicles, marine vessels, medical equipment carts etc. The rugged design makes them ideal for manufacturing industries to run their work process. We use best-in-class materials and advanced manufacturing techniques to fabricate sealed keyboards for various industrial applications. CTI’s industrial operator input devices are sealed effectively to resist moisture, dust and other abrasives and chemicals. The molded silicone keyboards provide excellent tactile response even while wearing gloves. The keyboards can be cleaned and wiped and this would not hamper their functionality. Industrial grade keyboards come in various models incorporating advanced options. Basic models can be customized as per the needs and requirements of customers. We offer various additional options which the user can select to perform his applications. A special key feature is provided which is molded in silicon material in order to see out working. Unique touch features provide users excellent comfort while typing. As per customers’ request, we can incorporate industrial joysticks on NEMA4 (IP66) keyboards. It ensures multitasking when you are busy handling other applications.